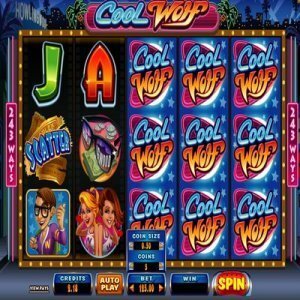 [miau] The slot game Cool Wolf is a non-progressive game with up to 243 pay lines and has five reels. It has a wild symbol, scatter symbol, as well as free spins, and the maximum jackpot is $5000. This game was created by Microgaming. This game is loosely based off of the Teen Wolf series, about a teenager that is also a werewolf. This game is based in Howlingwood, and you can clearly see the sign of the fictitious city in the background on the top of the game. There are 243 pay lines, which is somewhat mind-blowing, compared to other slot games. The wilds Are stacked, and the rolling reels, as well as free spins, can help you to win more throughout the game. There is a total of five reels, and each has three icons. The icons on the reels are of a cartoon, and the whole theme is based on the life of the teenager wolf, as well as his social life. Some of the icons are racer cars, cheerleaders, sunglasses, Cineplex, and also Cool Wolf. Additional icons include the letters J, Q, A, and K.Most of the icons are animated, but what really stands out are the wilds; while the Cool Wolf will appear, having a guitar in his hand. He then will begin to howl, before the reels will then begin to roll. The other icons tend to sit still, but they pulsate if there is a win. The soundtrack is somewhat made to mimic the Teen Wolf experience and is subjective to anyone who listens to it; if it’s something they like or not. Fortunately, the music does fit the game and werewolf sound effects will be heard during certain wins, as well as slashing sounds. The minimum bet is from $0.01 up to $50. The 243 pay lines can get up to a 10 coin bet. This gives you a great way to win more or less, depending on how much you choose to bet. You can also choose the automatic spin function, and another feature is you can turn off the sound if you’d like to, as well. This slot game has rolling reels which are a great feature. Any wins that you receive will trigger the rolling reels, and then the icons will vanish. After that, other icons from above, filling the void, allowing for more possible wins. 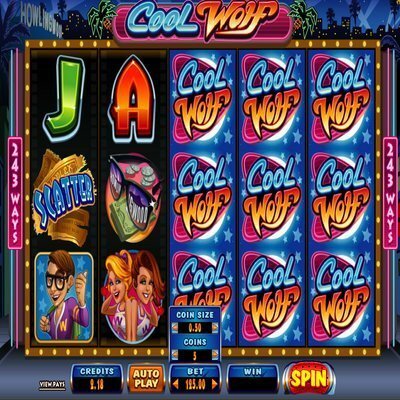 The logos for Cool Wolf can only appear on reels 3-5 in stacks. You’ll find over 40 total, and this can be a great benefit for the player, as these are also wild. You can also get randomly triggered Howling Wilds that can pop up on any spin, and help to turn any other icons into wilds; moving towards a possible win. If you get a ticket stub scatter of 3-5, it triggers free spins of either 10, 20 or 25. These free spins also include rolling reels, but has multipliers, and they increase each time you win. If there are five rolling spins; the multipliers can reach up to 10x’s. This is a fun themed game, especially for those who remember the movie it’s loosely based upon. Even with a lower jackpot of $5000, it’s a great game to try.